Do you want to build the home of your dream? 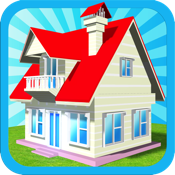 Dream Home Design is perfect simulation app to decorate your home with best furniture and other items. Increase your home value with new items and collect rent. Customize floor and wall. Expand your house for more rooms. Design your Living Room, Bedroom, Kitchen, Bathrooms, Study room and much more. Simulate your dream home in 3D view. You can rotate each items in 4 views. Not only home but also design your garden with trees. Both interior & exterior decorator. ~Over 300 items to place on your home. ~All high quality 3d items from 4 views. ~HD graphics with retina display effect. ~Variety of rooms to unlock. ~All Furniture, Electronics, Bathroom and Kitchen items. ~Change Floor, Wall, Doors and Windows. ~Easy to customize anytime and frequently. ~Nice environment with garden and roads. ~You can decorate garden with trees, flowers also.